Publisher: Gast Publishing Ltd., Hong Kong, China. This album was published in Hong Kong in the time when that city was still under english administration. This edition is sometimes referred as 'Cantonese' and therefor we gave it a seperate page. This is a Chinese edition, in traditional characters, printed in Hong Kong. 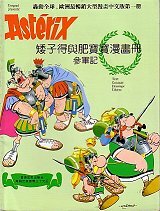 In old Asterix books there used to be a page with publishers around the world which listed this edition, so it is an "official" edition. Pinyin transcription by Hans Zwitzer. Yann adds that in Cantonese, the transcription of Asterix and Obelix reads "Aidzitak" and "Feipowpow". The style and the vocabulary chosen by Mrs Wong have a strong cantonese-like Hong-Kong flavour (and the translation is quite good). So, it is difficult to say if it is more HK-mandarin or written-cantonese.